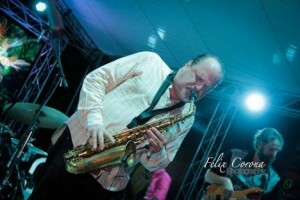 PUERTO PLATA, Dominican Republic — The Dominican Republic Jazz Festival celebrated its 18th edition with four nights of free concerts with tremendous performances, packed venues and glorious weather in Puerto Plata, Sosúa and Cabarete Beach November 6-9, 2014. 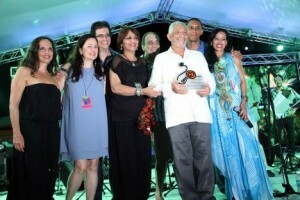 Of special note, the cherished Dominican composer-pianist Rafael Solano, 83, was presented with an award for his achievement in music, and gave a surprise performance of his famous love song, “Por Amor,” to the joy of the Saturday night audience at Cabarete Beach. Also recognized were musicians Marco Pignataro and Matt Marvuglio, of the Berklee Global Jazz Institute, for their continued support to the Dominican Republic Jazz Festival, FEDUJAZZ and youth of the world. With a combined estimated audience of 12,000 people for the entire festival, music lovers from around the country and around the world enjoyed the shows which included the sounds of Grammy Award winner Ignacio Berroa Group (USA) with Giovanni Hidalgo (Puerto Rico); Berklee Global Jazz Institute (USA); Ramón Vázquez TríoS (Puerto Rico) with Special Guest The Prodigy (Dominican Republic); Grammy Award winner Joe Lovano’s Quartet (USA); Colin Hunter & Joe Sealy’s Quartet (Canada); La Familia Andre (Dominican Republic); Edgar Molina (Dominican Republic); Wavelength – The Original (Israel); Patricia Pereyra and Band (Dominican Republic) with special guest Alex Jacquemin (France) and more. The Dominican Republic Jazz Festival provides more than culture and entertainment with its affiliation with FEDUJAZZ, a non-profit organization that conducts music education workshops for Dominican youth. Hundreds of schoolchildren from the north coast of the Dominican Republic attended engaging, educational sessions where the artists from the festival demonstrated their pure love of music and showed the children ways to connect with music in their daily lives. The Dominican Republic Jazz Festival’s 19th edition is set for November 5-8, 2015.